In almost every case the underlying issue turns out to be an incorrectly configured list segment; a member who has unsubscribed themselves; or a mis-understanding of how the data is sync’d between Member Splash and MailChimp. In this post we’re going to try and clear up any confusion and show you how to easily get to the bottom of these things if you run into one of these situations. We also highly recommend you check out MailChimp’s documentation for help understanding things like the difference between unsubscribing members from your list vs. deleting them or how to re-add someone to your list who accidentally unsubscribed (tip: You can’t, they have to do it themselves). The most important thing to understand is how users in Member Splash are linked to users in MailChimp: by email address. Each account in Member Splash consists of one or more members. In the diagram below we show a typical family account with four members. Two of those members have an email address stored in their user record. Those two members are sync’d to MailChimp. We emphasize “in their user record” because using an email address as the user login for an account has no connection to MailChimp. If the username for the Smith family is tomsmith@notarealemail.com but Tom Smith does not have an email address listed under his user profile he will not by sync’d to MailChimp. The next thing to understand is that all users on an account who have an email address listed will be sync’d to MailChimp. In the diagram above if you add an email address to the second member on the account they will also start sync’ing to MailChimp and receiving club emails. This is the most common reason for the answer to the first question: Why does MailChimp show more people on a segment than there are matching accounts in Member Splash? Because you likely have accounts with multiple email addresses associated. Therefore 100 family accounts could generate 180 contacts in MailChimp. 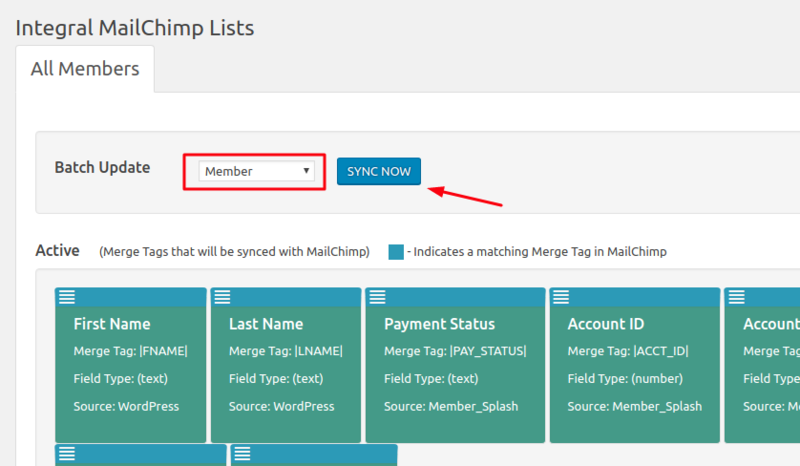 You can run a manual sync of your list at any point by going to MailChimp Emails -> List Management, selecting a list and the User Role you wish to sync (“member” for your members, possibly something different if you have board level accounts or similar you maintain a mailing list for) and hit Sync Now. MailChimp enjoys some of the best delivery rates in the industry — not an easy thing to achieve as email providers are in a constant battle to try and crack down on spam. The rules and technology behind that change constantly which is why Member Splash uses a dedicated service with the scale and expertise to ensure your bulk emails get through. To maintain their high delivery rates — and keep your club messages from being blocked or winding up in the spam bin — they enforce a number of policies. Email addresses that are returned as undeliverable are automatically removed from your list. The most common reason for this is an email account being deleted, such as when someone has been using a work email and changes jobs. Emails that “soft bounce” — are sent to a valid address but can’t be delivered — are removed after a number of soft bounces. A soft bounce is most commonly the result of an email account that has reached its quota. It’s a valid address but can’t accept any further messages until the account owner deletes some old ones. Finally, there are “orphans” — email addresses that exist in MailChimp but not MemberSplash. This most commonly happens when clubs either have bad info. in their initial data import or have manually added or imported addresses directly in MailChimp (so there is no corresponding record in Member Splash). The email address in Member Splash must exactly match the email address in MailChimp, that’s the unique identifier that links the two accounts. If the addresses don’t match then changes to the member’s information in Member Splash will not be reflected in MailChimp. The final item that tends to cause confusion is segments. MailChimp allows you to segment your “audience” (what they call your list of subscribers) into subgroups. This can be a handy tool but it has some limits and trying to overly fine-grain emails tends to cause issues. MailChimp allows you to define up to five conditions when creating a segment. The subscribers must meet either ANY of those conditions or ALL of them. The most common issues we see are things like the conditions set to ANY with payment status is unpaid and account type is X. That will go to all unpaid accounts. The match criteria should be ALL to restrict to only subscribers who meet both conditions. Another common mistake is clubs adding or deleting account types and forgetting to update existing segments. If you have a segment meant to go to all bonded members and you create a new account type like Bonded Senior you’ll need to update your segments accordingly. Finally, in many cases the value that is passed to MailChimp is numeric. The account type, for example, expects and account type ID, like 14, not an account type name like “Summer Member.” Again, that is covered in the article linked above. Being able to replace paper mailings with email is a great savings in time and cost for clubs but it is important to be aware that even in the best of circumstances you are unlikely to reach 100% of your intended members. People change email addresses without thinking to update their club account; email boxes get full; filters on the recipient end may mark your message as junk. If your segments don’t seem to match your expectations or you’re having issues with a specific member not receiving your emails the items above are where you want to look first.